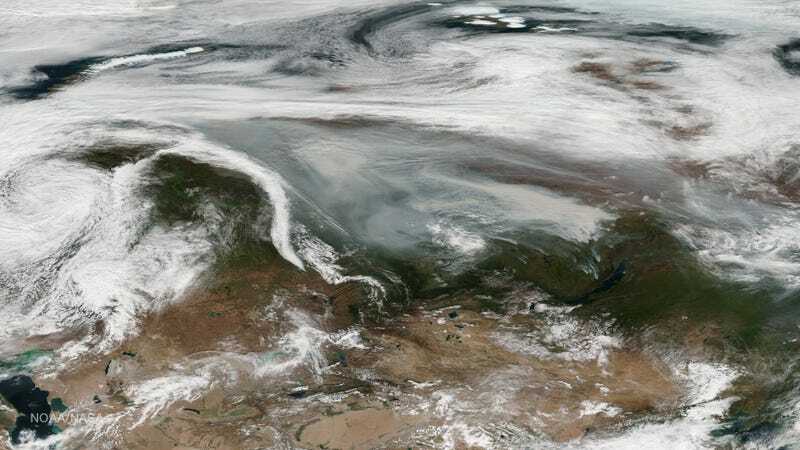 As enormous wildfires in Canada and the United States make headlines on the daily, Siberia has been burning ferociously all summer, and nobody seems to be noticing. Large wildfires are not unusual in Siberia’s boreal forests, but in the past few years, this sparsely-populated region has seen some of the most intense summertime conflagrations in its history. And the few dispatches we’ve heard from Siberia this summer—coupled with satellite images—suggest the 2016 fire season may be one for the record-books. “This year is unusual,” Sergey Verkhovets, Chair of Ecology and Environmental Studies at Siberian Federal University in Krasnoyarsk told Gizmodo in an email, adding that northwest Siberia’s Yamal peninsula and Yakutia region in central-eastern Siberia are among the places hardest-hit. According to Verkhovets, a “long dry period and unusual warm weather” is responsible for extending the 2016 fire season into the fall. Images captured by NASA’s Suomi satellite on September 18th (top) confirm that wildfire smog still envelops a vast swath of central Russia. Data on the fires, many of which are triggered by lightning storms and which go unsuppressed unless they threaten villages or infrastructure, is sketchy and conflicting. In June, an analysis by Greenpeace Russia claimed that 3.5 million hectares of land—a region the size of New Hampshire and Connecticut combined—had burned this year so far. But the Russian government only reported 669,000 hectares burnt for the same period. Satellite images captured in July painted an even grimmer picture, suggesting the fires could to be up to 10 times worse than the Russian government was reporting. Gizmodo has reached out to Russia’s forestry agency and Greenpeace Russia for up-to-date estimates of the fire damage, and we will update if we hear back. More worrisome than a single bad fire season is that we could be witnessing the new normal for Siberia. As the planet warms and the human population soars, fire seasons are growing longer and more intense around the world, meaning more and more heat-trapping carbon is going up in smoke.